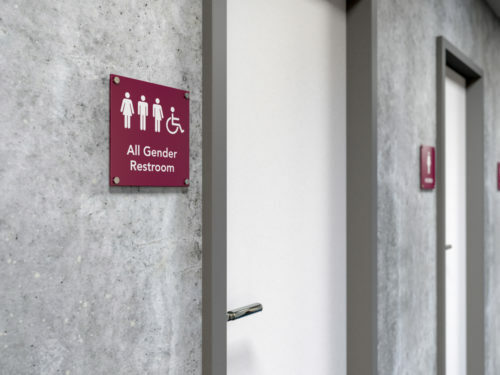 The International Code Council has approved a change to restroom standards recommended by the American Institute of Architects and the National Center for Transgender Equality that will update single stall facilities. The policy changes are simple, but impactful. The first proposal approved this week requires all single stall restrooms to show that they are available to all users, not a single gender. A second approved proposal allows for multi-stall gender-neutral facilities. These would include shared sink areas with private stalls for each toilet. These changes will provide more restrooms for transgender and gender non-conforming individuals as well as people with disabilities and their caregivers, families with small children, and others who simply need a place for those in need. Existing code has posed a problem with increasing the accessibility of facilities, with codes often requiring specific fixtures counts and specific assignments, which can limit their use. “In my teaching and in my practice, I’ve become increasingly aware that the ‘default user’ of architecture is basically a white, able-bodied, cisgendered male, and we tend to disregard other, non-conforming bodies,” architect and Yale professor Joel Sanders said to Architectural Digest. These changes in the International Building Code will help augment or eliminate some of these issues. With an increase in interest in restrooms in the light of policy threats from the Trump Administration, many in architecture have been looking at way of solving restroom accessibility issues, in particular for transgender and gender non-conforming users. One such example is Stalled! a project spearheaded by architects and activists to create safe, sustainable, and inclusive public restroom concepts. International Code Council is a 64,000-member group focused on building codes and standards worldwide, and their International Building Code standards the most widely used and adopted set of building safety codes. They are also the basis for building policy throughout the country, used to establish federal, state, and municipal construction standards.